We did not know this show was going to happen until 7 hours before. I had picked the band up at the airport on the night before and we had hoped for a gig on this Friday but nothing had happened. 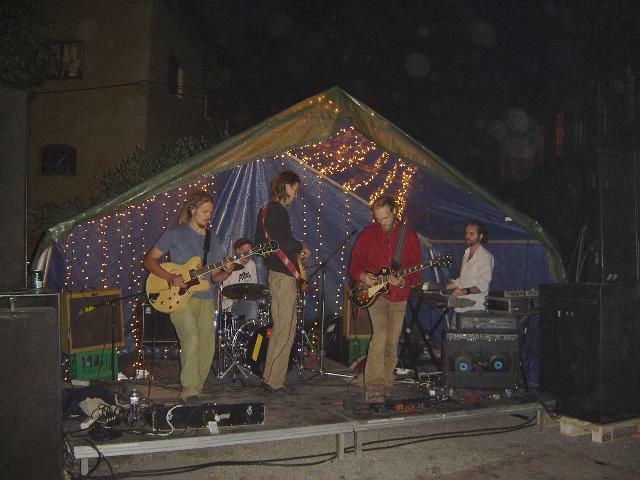 Then a friend of theirs, Sami, who lives in Christiania, called and said the band could play outside before the DJ started at 10 for one of the Pusher’s birthdays. We got the gear and went down there at about 5 or so and got everything set up in this small tent outside of the club Operaen. It was a beautiful day and night and everyone was feeling fine and high! Right about 8, they put on some bad dance music and a guy was sitting on a small board stage in front of the stage on a chair and this woman with huge breasts comes out and does a full blown strip tease for this guy and on top of him. Since everyone around was stoned and happy, and no one knew this was going to happen, it was quite a shock but fun. What a way to start. The band smoked a joint and hit the stage right after. They opened with a cool spacey freeform slide guitar (Mikko) jam before heading into "Kokkola". Mikko was totally on fire this night playing amazing guitar that Sami (guitar) and LöQ (synths) wrapped around, and Teemu (Drums) and Kimmo (bass) were totally solid to allow the band to fly. The sound was amazing (thanks Jasse-Possible Apple). The band played a lot of stuff from the new CD, Balansia. "Pajas" was next followed by "Modus Operand Heremetic". The band really started to stretch out the jams with "Pako Orginaux" and "Terra Hidria". "Terra Hidria" is such a great song and groove and both guitar players play amazing stuff. The reggae inspired "Sindran Rastafan" was 15 minutes and incredible. The people around were dancing and really enjoying the free music on this great summer’s night. The band closed with Sami’s song from the new CD, "Terrapita", perhaps my favourite from the new CD. About 80 minutes and really excellent. A free bar with free vodka (juice or coke) was now open and people were getting wasted. It was nice to see no or few police and no hassles. A great night. Set List: Intro Jam>Kokkola, Pajas, Modus Operand Hermetic, Pako Orginaux, Terra Hidria, Sindran Rastafan, Tarapita. Everyone was up late and some got pretty drunk, so we were a bit behind schedule. Today it had been arranged that the band would play in the court yard of the old Charlottenborg Castle, which is now just a huge art gallery. It was a big opening of a new exhibit featuring a lot of artists, including the Finnish artist, Seppo Renvall, who had arranged this music. They set up a tent sauna as well. It was going to be special. We arrive with the equipment at 14. We were suppose to be there at 13 but everything is cool. It is pretty hot and sunny today which is great. A lot of people going in and out of the gallery and wondering what the hell is going on, as nothing like this has happened here before. A bit after 3, Harlots of Beyond (Arne) played a short 30 minute set of raw gothic dark blues rock. Arne is the guitar player and writes all the material. He has been making Harlots of Beyond music since 1981. 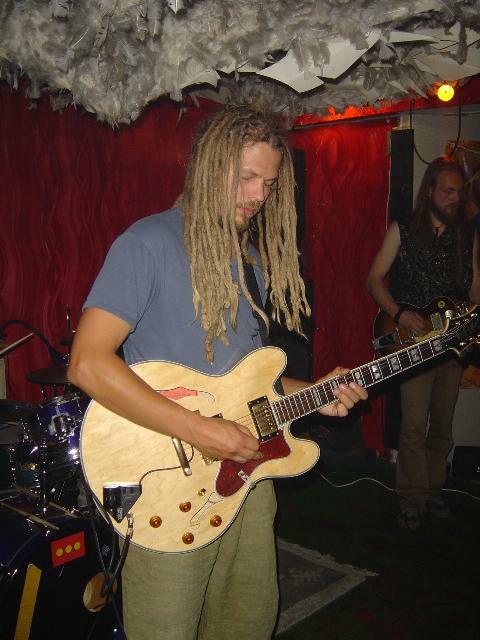 He was backed by Teemu (Drums), Kimmo (bass) and Mikko (guitar) from Hidria Spacefolk. A strange set of music. After he finished the Hidria guys took off their clothes and wrapped a towel on and went into the sauna before starting to play! I had never seen anything like it. Must be a Finnish thing! Anyway, after 10 minutes they emerge and go straight to dry off and put on their instruments. The band open with the slidin’ sauna jam and into "Kokkola". This set was even looser and had a more improvised feeling than the gig the day before. "Tarapita" was nearly 15 minutes and "Sindran Rastafan" over 18 minutes. There was a lot of people, 200 or so sitting or standing and watching, and people were still coming in and out of the gallery. It was a great atmosphere and the sound in the courtyard was great. The band were having fun as well. Near the end of "Sindran", Teemu left the drum kit and went back in the sauna and Sami took over on drums for like 2 minutes. This is a really special band with a cool unique sound. The band closed their hour long set with "Pako Orginaux". At 6:30 the van was coming to transport all the gear out (and Sauna!) to Dragens Hule for the night time gig! This was going to be a party. We got some pizza and hung out. 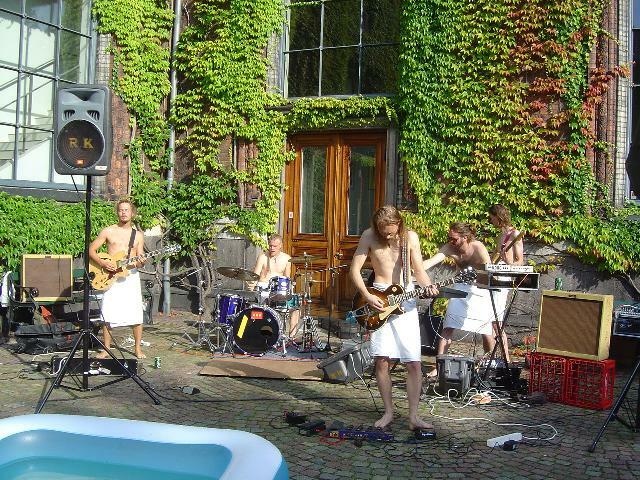 It took some time but we got the gear and sauna and everything out to Dragens Hule and set up for the gig. The Dragens Hule people were very happy to see the band again as last years gig with Bland Bladen and Mantric Muse was probably the most amazing gig ever at the club. Anyway, a local band called TORN was set up and Hidria would set up afterwards as they had this massive drum kit and it would have to be taken apart. I was expecting a lot of people but it was not as many as last year, even though the weather was amazing. Seppo had brought a projector and was showing images up on the wall outside the club and we had a nice fire. A lot of my friends, Julie, Tom, all in Bland Bladen except Dave, Soren and Magnus from Mantric Muse, and others showed up to support the gig! TORN, call themselves progressive rock but they certainly were not. It was quite loud but good sound. They had some of their friends (who took pictures) and sat in the front. I felt bad for them as this was mostly a crowd to hear Hidria and the club cleared out with only like 10 people after a few songs. The band is highly influenced by TOOL and not very original. The singer really has hard work ahead of him as he was the weakest link in the band. A lot of TOOL like riffs, a lot of the same and very few guitar solos. The drummer was solid but seemed to overplay a bit and not really in the right places it seemed to me. A misplaced band for this bill. After about 45 minutes and we heard some Antibalas Afrobeat Orchestra. Hidria was ready to fly and fly they did. People were quite high as a lot of joints were smoked tonight and the beer was flowing! The band opened with "Astroban" and into "Nasha Universo", a song not played in like 1½ years! It was great to hear some different material. The sound was great and everyone was feeling great. Mikko was a bit tired and did not play as fluidly as the previous gig, but Sami (who had a bit of a fever) was incredible and ripped it up totally. I was really blown away but the array of sounds he pulled out of the guitar and the way he could intertwine with Mikko’s playing. Next up was "I Mantra"!